Western lowland gorilla | Dallas ZooHoo! 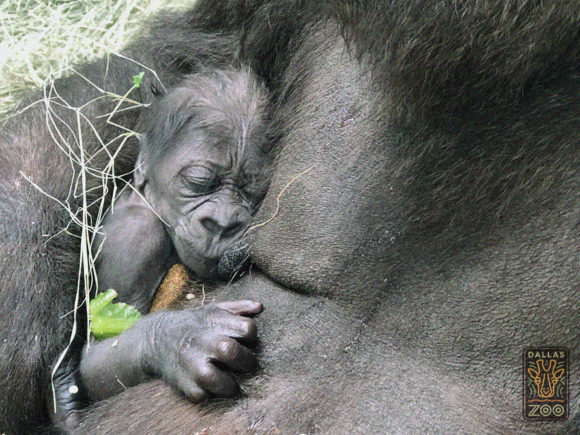 Dallas Zoo staff are smiling big after welcoming our first baby gorilla in 20 years on Monday, June 25. This also marks the fifth baby gorilla the zoo has cared for in nearly 50 years. barn after laboring for just over an hour. Hope and the baby are both doing well. Mom is tired but she’s tending to the infant perfectly, and the baby appears to be strong – gripping onto mom, and nursing frequently. Baby was holding onto mom on its own (as it should) immediately after birth. Silverback Subira, a first-time father, was the first member of the troop to greet the baby, gently putting his lips on the infant’s head shortly after birth. This is Hope’s second baby – she delivered her first in 2004 at the ABQ BioPark Zoo in Albuquerque, NM. Hope arrived at the Dallas Zoo in February 2017 on an Association of Zoos and Aquariums’ (AZA) Species Survival Plan breeding recommendation in *hopes* of increasing the population in North America. The zoo cares for nine gorillas, including its bachelor troop who live on the south side of the Gorilla Trail, and the family troop who live on the north side. The family troop remains behind the scenes where Hope and her baby are bonding privately. Hope continues to keep her baby close, so keepers have not been able to definitively confirm the gender. Twenty-two-year-old father Subira is very curious of the infant and calmly investigates the little one; 13-year-old female Megan is the most inquisitive, staying very close to Hope; and 21-year-old female Shanta is extremely respectful of Hope, giving her privacy and space. 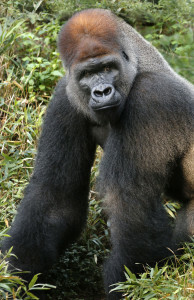 Due to habitat destruction, poaching for bush meat and the animal trafficking trade, and disease, gorillas have never been under greater threat in the wild. According to the Dian Fossey Gorilla Fund International, the world’s leading gorilla conservation organization and a Dallas Zoo partner, there are approximately 350,000 western lowland gorillas left in Africa. Native to the Congo Basin, western lowland gorillas are the smallest of the subspecies and the least critically endangered. 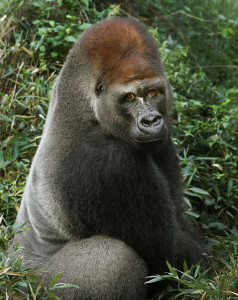 There are roughly 3,800 Grauer’s gorillas, 880 mountain gorillas, and 300 Cross River gorillas remaining in the wild. With 295 western lowland gorillas living in AZA-accredited zoos, the nation’s top zoos have never been more committed to protecting this species in human care and in their native habitat. Baby rests while Hope eats (note mom’s food droppings). 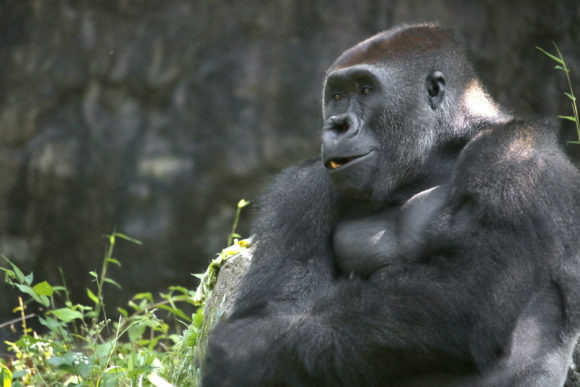 The Dallas Zoo has supported gorilla conservation for many years. A species that is close to our President and CEO’s heart, Hudson is the immediate past chairman of the Board of Trustees of the Dian Fossey Gorilla Fund, where he’s been a member since 2007. He serves on the board of directors for the Gorilla Rehabilitation and Conservation Education Center (GRACE), as well. Zdrojewski is also on GRACE’s Animal Care and Welfare Advisory Group – he helped the organization open a one-of-a-kind forest enclosure in the Congo for its orphaned Grauer’s gorillas in 2015. Our animal care team aims for Hope and her baby to make their first scheduled public appearance within the next week or so. We will share the date on our social media pages, so stay posted! Every morning, more than 100 trackers set out from the Karisoke Research Center in Rwanda to protect nearly half of the nation’s mountain gorilla population. The trackers monitor the gorillas round-the-clock, serving as the first line of defense against poachers. Each individual tracker is assigned a gorilla group; it is their job to locate group members and record data used to study the species. This continued daily commitment is what it takes to ensure the survival of critically endangered mountain gorillas. The Dallas Zoo and the Dian Fossey Gorilla Fund International are in this battle together, pledging resources, time, and efforts toward gorilla conservation. Established in 1978, the Dian Fossey Gorilla Fund has dedicated nearly 50 years to protecting mountain gorilla populations. As a result, mountain gorillas are the only species of ape whose numbers are slowly increasing; how ever, with less than 900 individuals remaining, this species is still critically endangered. And at the Dallas Zoo, we’re honored to support the Dian Fossey Gorilla Fund as one of our conservation partners. 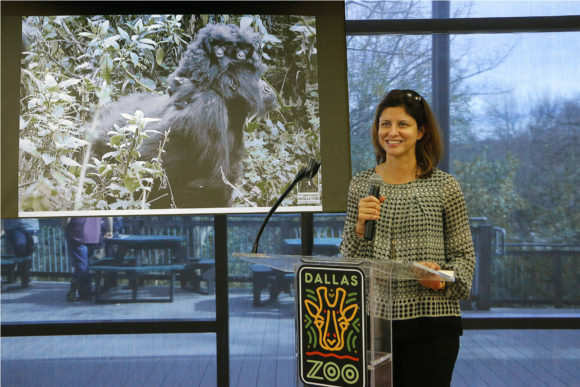 In January, Dian Fossey Gorilla Fund President and CEO/Chief Science Officer Tara Stoinski spoke during a Dallas Zoo Wild Earth Conservation Lecture held at the Angelika Film Center here in Dallas. In addition, she gave an inspiring talk for Dallas Zoo keepers and staff about the Fund’s latest developments and updates on the animals they protect. But the story doesn’t stop there. Gregg Hudson, president and CEO of the Dallas Zoo, currently is the immediate past chairman of the Board of Trustees of the Dian Fossey Gorilla Fund International, in which he’s been a member since 2007. 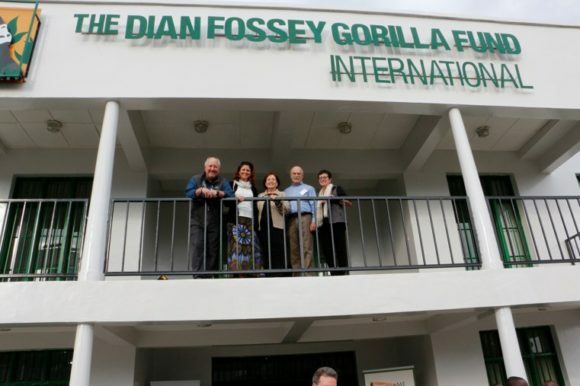 In celebration of the organization’s 50th anniversary, he and the rest of the board of trustees traveled to Rwanda in late February to meet the partners of the Dian Fossey Gorilla Fund who are working in the wild. This group also included two of the Fossey Funds newest Trustees – Dallas Zoo board member Diane Brierley and the Zoo’s Special Counsel Bill Evans. “It’s amazing to take what we do at zoos, our special talents, and apply them to other meaningful organizations. Zoos are a conduit from our communities to these important, large-scale projects. We have a responsibility to go beyond our gates and be involved in wildlife initiatives outside of the Zoo,” explained Hudson. Once in the heart of the Virunga Mountains, the trustees embarked on treks through the Rwandan bush to see both gorillas and golden monkeys. This amazing experience also highlighted the Fund’s numerous health, education, and economic development initiatives, which encourage Africans to become conservation leaders. The trustees visited community education and health projects in Bisate Village and spent a gratifying afternoon with the Karisoke trackers. 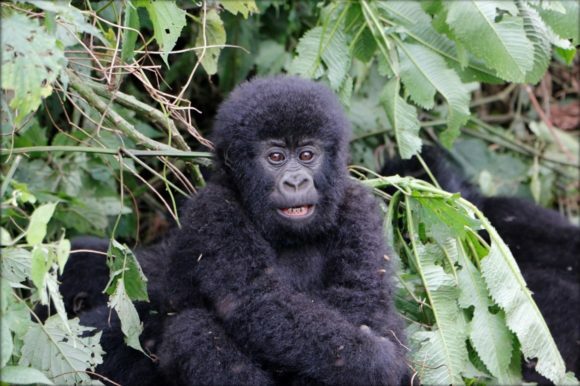 “I am just blown away by what the Dian Fossey Gorilla Fund does. It’s one of the longest, continuous field projects in the world. On top of that, it’s connected to this incredible community in Rwanda where they have helped build a health clinic and create educational programs at local schools. Gorillas are fascinating animals, but the impact of the Fossey Fund on the community is incredible, too,” Hudson said. The trip culminated with a reception at the home of U.S. Ambassador to Rwanda Erica J. Barks-Ruggles, an eminent supporter of gorilla conservation, fostering hope for the future of a troubled species. 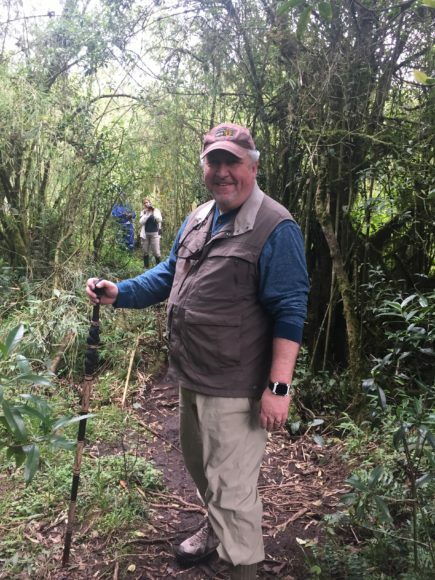 Hudson’s trip emphasizes the importance of partnerships like those between the Zoo and the Dian Fossey Gorilla Fund as they bring together conservationists from around the world to collectively further research and prevent species extinction. “The Rwandan people see gorillas as part of what makes their nation special. I feel a lot of personal pride for helping with each new sustainable, long-term initiative. It’s a rare and fulfilling chance to create a legacy project that will help gorillas in the future,” Hudson stated. Learn more about how you can support the Dian Fossey Gorilla Fund’s conservation efforts by symbolically adopting a gorilla. Dallas Zoo’s Primate Keeper II Ashley Orr guest blogs for ZooHoo! You may have seen the original viral video of gorilla Zola dancing in a puddle when he was a youngster living at Calgary Zoo, and his passion for splashin’ has only continued with age! However, there’s a lot more to this behavior than a great ape groovin’ in the water. Zola is a 14-year-old male Western lowland gorilla, and the youngest member of our bachelor troop. When he isn’t hanging out in the South gorilla habitat, Zola spends his hours inside our roomy gorilla building. The big, blue pool featured in this video is one of many enrichment items the gorilla keepers use to engage primates. The Association of Zoos & Aquariums defines enrichment as a process to ensure that the behavioral and physical needs of an animal are being met by providing opportunities for species-appropriate actions and choices. Enrichment helps enhance the environment and lives of animals by providing them with mental and physical stimulation to increase natural and healthy behavior. This is an important component in caring for all zoo animals, but primate enrichment is among the most complex and varied. Enrichment can take many forms; it can be an object such as a ball, a scent like an herb or perfume, visual stimulation such as a mirror, a change in an animal’s company or location, an activity like painting or training, introduction of a new food, or a challenging food presentation… the options are almost limitless! As keepers, we are constantly coming up with new and fresh ways to enrich our animals. And clearly the pool is a favorite for Zola! Zola’s “dancing” is really just a play behavior (there was no breakdance music playing in the building, we promise). Play is a natural behavior present in a wide array of animals. In fact, the presence of play can signify an animal is content or comfortable, and it is recognized as an indicator for general welfare. It is easy for anyone to appreciate the good time that Zola is having in the pool because we recognize some of the same signs of play that we see in people. Gorillas in the wild have been observed to willingly enter the water to feed or to cross to other areas. Some gorillas have even been documented using long sticks to probe beneath the water and gauge depth for safe passage (fun fact, gorillas are anatomically too dense to swim). This is an impressive example of great ape intelligence. Visit Zola and the three other gorillas in our bachelor troop, or the four members of the family troop, to watch them engage with enrichment in their habitats. Proceeds from your visit help purchase enrichment items for our Zoo animals, and also support our conservation partners in the field, like the Dian Fossey Gorilla Fund and the Gorilla Rehabilitation and Conservation Education Center (GRACE), that help gorillas in the wild. Silverback Subira in his new habitat at the Dallas Zoo. He’s a sight for sore eyes — a handsome fella and a patient man (swooning much?). 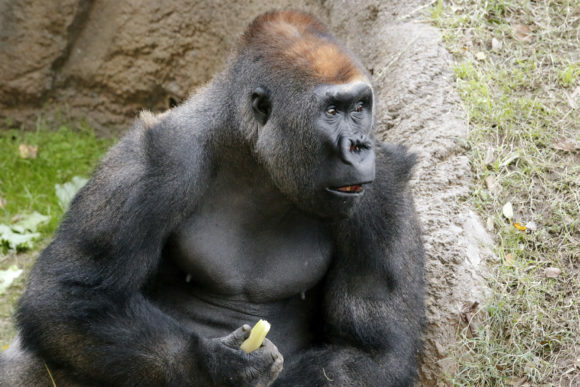 Subira, a 19-year-old Western lowland gorilla, has joined the Dallas Zoo troop as a breeding male, creating our first family group in over a decade. Subira is very caring and the introductions have gone perfectly. All four gorillas have been together 24 hours a day since last week. Subira went out into the habitat with the females for the first time this week, but is still a little hesitant to explore. 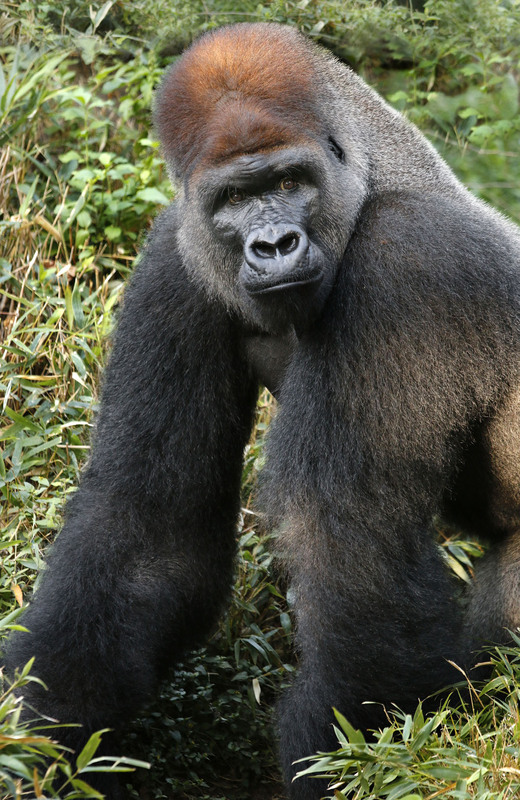 The breeding recommendation comes from the Species Survival Plan (SSP) for Western lowland gorillas. SSP is a conservation and breeding program of the Association of Zoos and Aquariums that manages efforts to ensure genetic diversity for the survival of endangered species. It’s a hopeful future for our new family group! You can find the group out every day in the north habitat, along the Gorilla Trail entrance near the Giants of the Savanna.